Father of the bride wedding handkerchief gift. Father of the bride wedding handkerchief gift. A traditional gift for the Father of the bride on the big day. 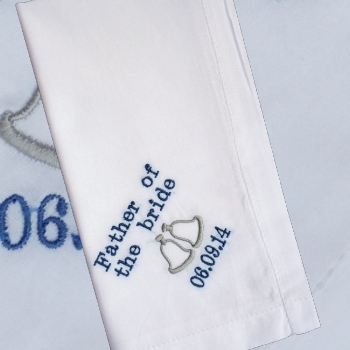 Single white handkerchief embroidered with the title Father of the Bride, a bells motif and your special wedding date. Embroidered on a standard mens classic white cotton handkerchief or you can choose a mens wide hemstitched large cotton handkerchief. Just fill in the option box with your wedding date in number format. Choose what colour embroidery thread you would like us to use for the text, letter font style and also choose if you would like silver or dark gold bells motif. Personalised gifts are custom made to order - usually in 2 working days.